Chad and I left Los Angeles early on this chilly morning, arriving in St. Louis just after Noon. Knowing we would only be in the city for one night, I kept things simple: I booked a hotel near the airport, which was also close to a Metrolink train station so we wouldn't need to rent a car. Lucky for us, the hotel also included a delicious free breakfast at the Golden Pancake next door, which allowed us to fill our bellies from the long flight before the obligatory nap that followed. Descending into the frigid climate a few hours later, we took the train downtown to meet my friend Ashley for dinner at Caleco's, a traditional Italian restaurant located a few blocks from the Edward Jones Dome, home of the St. Louis Rams. Terrific food and sparkling conversation ensued, before we once again braved the elements and walked to the football stadium. As I had feared, there was definitely a sense of dread being experienced by the Rams fans - they knew their team was all but gone, and tonight's game was one last chance to say goodbye. The building was half-filled and it was much more quiet than you'd expect at a professional sporting event, but we still made the most of our evening. I wound up getting some very good seats, so we simply sat back and took in the action. We did get a chance to walk around the Dome as much as we could, knowing that it might be the last time we'd ever be inside, and thankfully the Rams gave their fans a much-needed victory to send them home on a slightly positive note. One month later, the inevitable came to be: the Rams would indeed be moving to Los Angeles. It may have added a bittersweet note to my memory of that evening, but I'm still glad I got to see them once. Chad woke up early to pick up our rental car, and we were on the road before I knew it. Our first stop would be two hours away in Marion, Illinois where we would meet up with our good friend Adam, who had driven three hours himself. Adam is a longtime hockey fan, and even lived in Los Angeles for a few years, before moving back to Illinois - we successfully convinced him to come to Nashville with us for the weekend, hoping that our presence in the area combined with a hockey arena that he'd never seen would be enough to sway him (it did). Adam dropped his car off at another friend's house, and we continued on our three-hour voyage to Music City. Driving across the Midwest in the dead of winter can be as boring as you can imagine, so we were quite relieved to arrive at our hotel just as the sun went down. After a brief stop to unwind in the room, we quickly headed downtown to see one of the most famous venues in the country: the historic Ryman Auditorium. The legendary Grand Ole Opry show began their run at the Ryman in 1943, before moving to their permanent home in Opryland forty years later. Since the late 1990's, the Opry show returns to the Ryman every winter for a three-month stand, which allowed us the chance to see both the show and venue during our hockey road trip (something I had always planned). What we witnessed this evening was two hours of wonderful entertainment, simultaneously broadcast to a live radio audience as well, highlighted by a country music star I've long admired, Vince Gill. Craving some late night comfort food, a friend recommended the Broadway Brewhouse, which was the perfect spot to wind down the night before heading back to hotel. Saturday would be our only full day in Nashville, so we were planning to make the most of it. I was absolutely mesmerized as I stood in the presence of this amazing work of art - the rest of the museum, although fascinating, seems to pale in Athena's company. 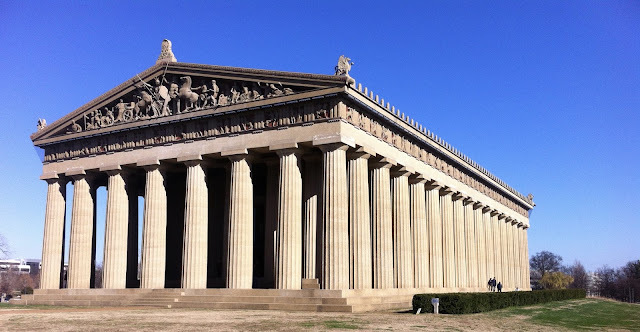 Though one might think that Tennessee would be a fairly warm state due to its association with southern climates, it was actually quite cold this day, so we quickly walked from the Parthenon to the nearby campus of Vanderbilt University. I had always wanted to see a basketball game at the historic Memorial Gymnasium, and when I planned this trip I noticed that the Vanderbilt men were playing a matinee game that day, so it worked out perfectly. Or so I thought. About a month before we got there, it was decided that the afternoon game would be switched to an evening contest - as a result, we simply spent the time walking around the outside of the gym itself (although I did get a chance to sneak inside to admire the interior while another team practiced on the court below). Having some time to kill before the hockey game, we continued our walk to see what else downtown had to offer. I'll admit that I'm not a huge fan of country music, but I've always felt a certain level of respect for the genre. My parents always enjoyed playing music in our house, which quite often would feature some of country's biggest stars, from Randy Travis to George Strait to Reba McEntire. I knew fairly little about these artists, so I thought a trip to the Country Music Hall of Fame would be in order, and I was not disappointed in the least. We would go on to spend several hours - virtually the entire Saturday afternoon - at the venerable museum. On this particular day, the Hall of Fame was home to an exhibit celebrating the career of Trisha Yearwood, which is where we began our visit. From there, we covered every corner and admired every artifact on display, recognizing some of my favorite artists in country music such as Glen Campbell, the aforementioned Vince Gill, as well as the Dixie Chicks and Taylor Swift. Like the Parthenon, I cannot recommend the Hall of Fame enough, and I firmly believe ANY visit to Nashville must include a stop at both of these landmarks. Night had fallen and it was time to eat, so we walked back down Broadway and went to the very popular Jack's BBQ. The line was long, but the wait was worth it - we feasted on a variety of smoked meats and tasty side dishes, before heading back across the street to the Bridgestone Arena. It was hockey night!! As most of the hockey world has recently discovered, the atmosphere surrounding this arena is unique. The live music and incredible food along Broadway make for a very rewarding experience, and an ideal spot for pregame festivities. The 2016 NHL All-Star Game was to be held the following month in Nashville, so there was a miniature ice rink set up across from the arena as part of the impending Fan Fest. The cold weather didn't necessarily keep the fans away, as crowds swarmed the area for a chance to skate around, but we had to head inside and couldn't participate. Once inside, we used the time before the game to walk around the concourse - I had a particular appreciation for the Predators Team Store, which is one of the biggest I've seen in all of my arena visits. Suffice it to say, I was very impressed with everything I'd seen so far in Nashville, and the game hadn't even started yet. Divisional rival Minnesota was in town, and it was electric during pregame from the moment the Predators skated out from inside their saber-toothed tiger logo. 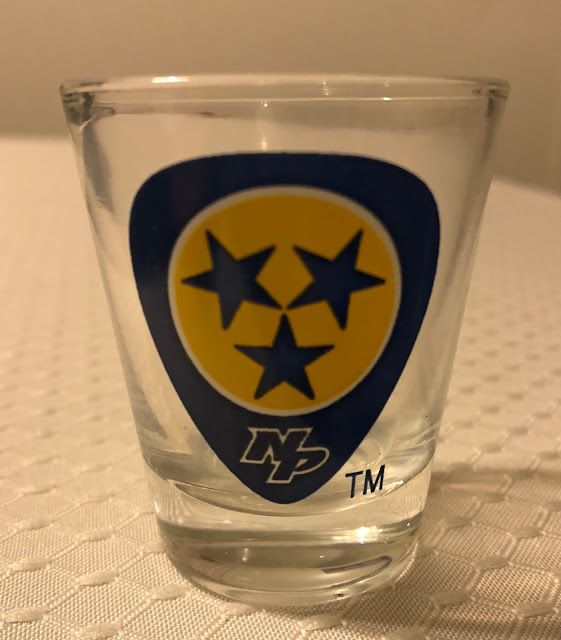 This would carry right through to the opening faceoff, and when Filip Forsberg scored for the Predators during the first minute of play, the arena went bonkers. I swear the whole place was shaking - it was incredible! About halfway through the first period, Wild forward Jason Zucker got hooked on a breakaway and was awarded a penalty shot. However, Nashville goalie Pekka Rinne was up to the task, and turned away the speedy forward to preserve the 1-0 lead. Mike Ribeiro gave the home team a 2-0 lead before the period ended, and James Neal extended the lead midway through the 2nd - though Minnesota would finally get on the board moments later. Zucker got his revenge with a goal in the third, which set the stage for a dramatic final 10 minutes. Try as they might, the Wild just couldn't solve Rinne and the Predators escaped with a 3-2 victory. Our time in Nashville was coming to an end, but I couldn't have asked for a better day. It was time to return to our families in Illinois, but I convinced Adam and Chad to make two stops with me along the way. I'm always on the lookout to add more CD's to my music collection, and our hotel had a brochure promoting a great local record store called The Great Escape, so we stopped there to do some shopping. 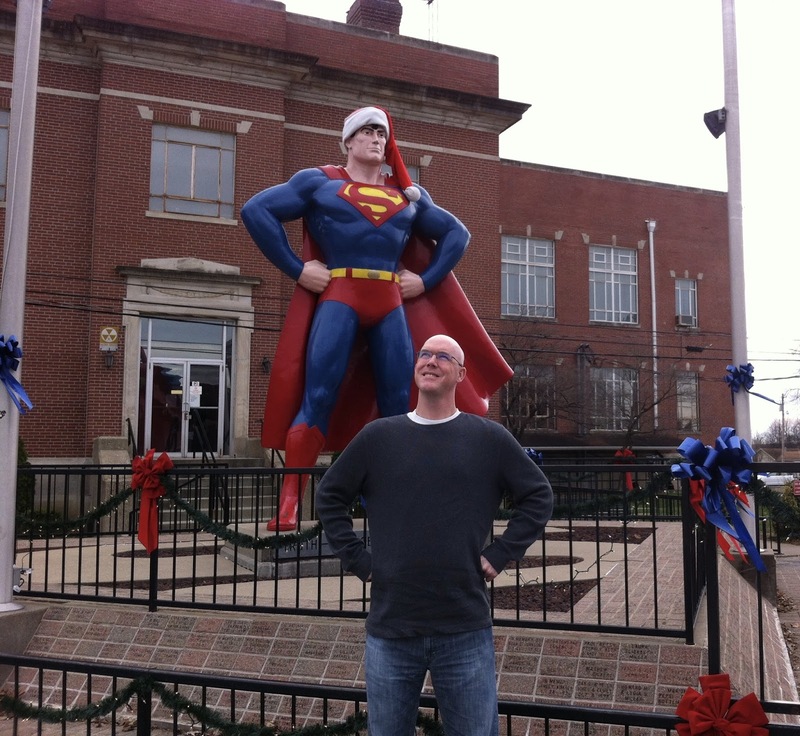 Finally, we drove two hours across two state lines to arrive in Metropolis, Illinois - home of Superman! Much like seeing a Rams game, visiting this small town at the southern tip of my home state was something that had eluded me during my years of living in the area. Now it was time to finally end this road trip by seeing that great roadside attraction that had been calling out to me for all those years! To my surprise, the Predators Team Store did not have any shot glasses with the team's awesome primary logo - instead, they offered this glass featuring the secondary logo (which can be seen on the shoulder patch of their jerseys). It might not have been what I was expecting, but it was a welcome surprise and a great souvenir.